Remember my old wink eye iPhone case? I miss it! But now I'm instead trying on the designers shoes - Chiara Ferragni. I just got a new pair and am sitting pretty in my living room admiring. Excuse the sock imprints! HA. Retro? 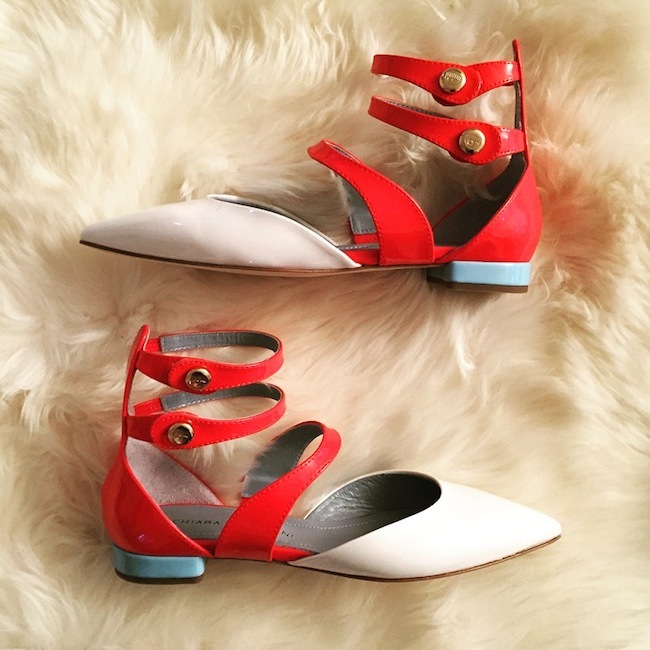 I love the white and red patent color way, with gold button snaps and the light blue heel. Also those horizontal straps. I've been looking! I have a feeling we're going horizontal in straps this summer. Not the criss cross lace up straps we all had last summer. Also hot on the market right now are white shoes, and no they don't look like nurses shoes! White - the new basic color, as opposed to black.